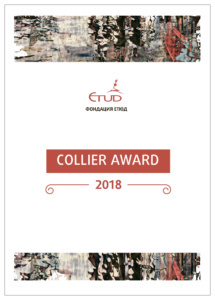 ‘The Collier Award’ (an artists’s recognition) was established by Etud Foundation in 2017 and it is awarded to artists from various fields of arts. The award is named after Nathan S. Collier without whose financial support there would be no Etud Foundation or Etud Gallery. Ani (Vladislavova) Collier and her husband Nathan live in the United States and support art in Bulgaria through the Etud Foundation and Etud Gallery for more than a decade. The award (3 000 lv) is not related to a future project or past achievements, but is given to people whose life is dedicated to art. ‘The Collier Award’ will be awarded for a second time on June 26 (Tuesday) during the III edition of the Festival ‘Etud and Friends’, after a concert night at DNK-Space for Contemporary Dance and Performance. The two recipients will be announced by Ani Collier, founder of Etud Foundation.